I’m posting my November newsletter a few days early to make sure you know about Red Yarn Puppet Band’s Halloween Spectacular at Mississippi Pizza, 5-6pm on Wednesday. See the flyer below; here’s the Facebook event to share with your friends. We’ll be pulling out all the stops; expect spooky stories, haunted American folksongs, the Big Bad Wolf, a giant skeleton, and more. Please know that this show could be scary for younger kids–I’m recommending it for fearless 4-year-olds and up. Younger ones are welcome with the understanding that some content might be frightening. Hope to see you and your family there! From November to April, I’ll be performing on the first Monday of each month at the World Forestry Center’s Mommy and Me Mondays. Come out at 10am on November 5th for my first show there. I’m debuting my Social Skills Stories for Preschoolers, mixed with good ol’ animal folk songs and stories. If you have a school-age child, please consider me for an arts residency at his/her elementary school. I offer a program called “Folk Song Puppet Show” through Young Audiences. 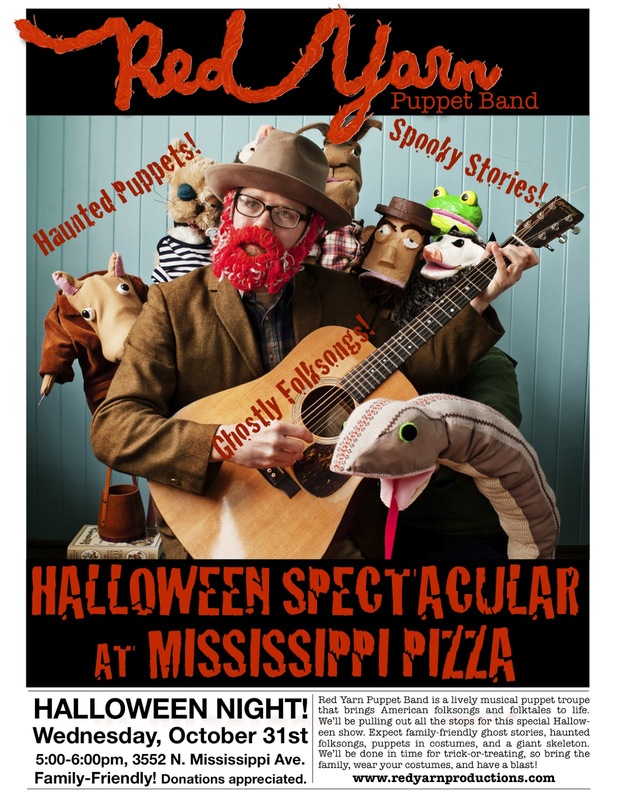 I’ll visit your child’s class 3-5 times and help them adapt a classic American folksong into a musical puppet show. Each child builds his/her own elaborate sock puppet. For more information, visit my artist page on the Young Audiences website, or read a description on my website. And of course, keep me in mind for your child’s next Birthday Party! You can always show your support by “Liking” Red Yarn on Facebook and spreading the word to friends. I hope to see you soon!